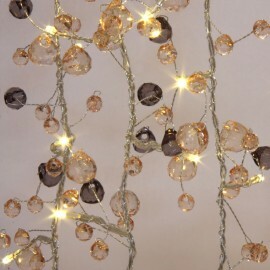 Inject a warm glow around your home with Coco Chic Light Chain. The coco chic LED light chain is available as a mains operated as well as a battery operated option. Mains powered: 50 LED bulbs, total length 6m of which 3, illuminated. Includes Transformer. Battery operated: 27 LED bulbs, total length 2.2 meter of which 1.7m illuminated. Requires 3 X AA batteries (not included). The elegant coco chic light chain has many uses around the home. We suggest you can either place the battery operated light chain in the centre of your dining room table instead of a candle or drape it across the mantelpiece. Can also be used to good effect to light a dark corner in any room of the home.